Piepho Moving & Storage has the storage solution you need, right here in Eagan, Minnesota, part of the Minneapolis- St Paul metro. You can safely keep your possessions close to home with our outstanding storage facilities. Are you building a new home and need secure storage for your belongings? Traveling abroad but looking to store your possessions in your home state? Or are you simply running out of space and want to declutter? Our storage solutions are perfect for anyone in need of extra space. Take a look at our Eagan, MN storage facility, and you’ll find budget-friendly storage that also brings you peace of mind. Our storage facilities are clean, safe and secure. We put the same level of quality into our storage services as our moving services, so you can rest assured your possessions will be treated with the utmost care. Your stored items will be safely moved by our experienced team members, and carefully organized to prevent mix-ups. Secure Access— Visitors to our storage facilities are always accompanied by one of our background-checked staffers, to ensure your belongings are safe. Climate Controlled Environment— Our storage facilities are temperature and humidity controlled to help keep your possessions in great shape. Coverage Continuity— If you have valuation for your move with Allied Van Lines, your coverage extends to our Eagan storage facility. Short Term and Long Term Storage Solutions – Whether you require our services for a few weeks or a number of years, we will take care of your possessions for as long as you need us to. Affordability — Discuss your needs with our team and we can provide you with a quote that fits your budget. Flexible solutions — Looking to store something special? We can take care of all kinds of items. From high-value family heirlooms to large, delicate and fragile items. Speak to one of our friendly team members and we will be happy to accommodate your needs. 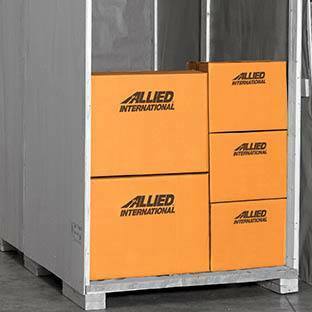 Storage for Businesses — Our storage solutions are not just for residents. We also offer secure storage solutions for businesses. Our facilities are perfect for storing records and other documents, office furniture, professional equipment, technology and more to help you free-up office or business space.